Not sure if this should be sent to the [email protected] email (and turned into a ticket) or here. But, see attached images: my goal was to view the results of task as a Nozzle summary report. It seems at least 2-3 clicks in this navigation path can be avoided in the common case. 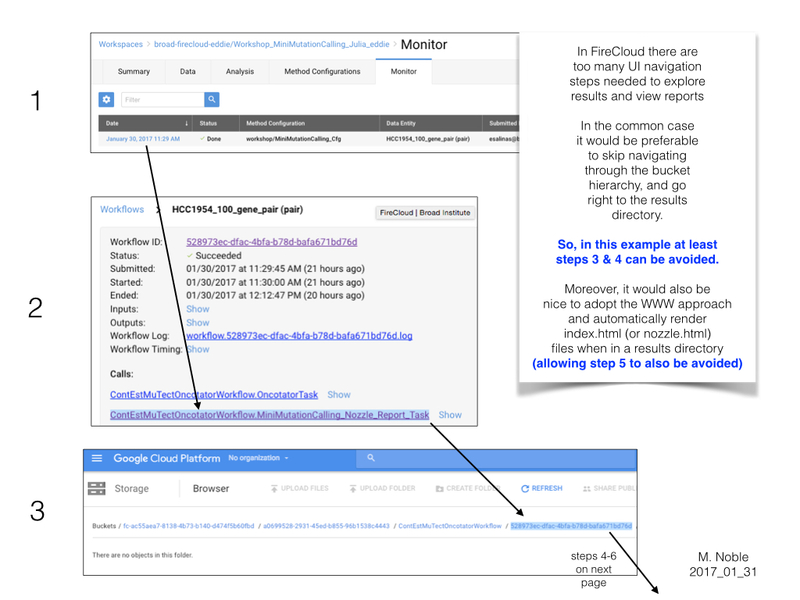 If a single file is explicitly delocalized, one may, in the task, for the workflow, under the submission, under the monitor tab, click on the "Show" text (near "Outputs") to list it (along with other outputs such as stderr and stdout) and a link next to it. Hi @mnoble, this is indeed the right place for your question. As I understand it the nozzle reports are not a FireCloud feature as such, they are actually features of the CGA workflows themselves. So the FireCloud platform itself is agnostic to them. That being said it may be possible to make nozzle reports first class citizens in FireCloud, which would enable us to expose them more straightforwardly in the UI. Or more generically, any report produced by a workflow that the user wants to "promote" in the is way. If there's a lot of demand for this potential feature we can certainly discuss and see if we can put it on the roadmap. @mnoble I re-read the question and realized you probably weren't asking for something specific to to nozzle reports, but output files in general. If so, there's some work going on this quarter to streamline the user experience, so I'll make sure to pass this comment on to the team that's working on this. That makes sense -- I don't like context-switching between the FC UI and the Google console either. How do you feel about the experience of looking at the workflow outputs as they're listed per-task in the workflow overview, like in the screenshot Eddie posted above? Yes, what Eddie pointed out is a bit better than navigating the bucket hierarchy. Count that as a relative newbie mistake on my part to miss this in the UI. But still, look at the latest image I've attached: even though unhiding the outputs does reduce the amount of click-through, it seems the UI can still overwhelm (e.g. for exposing the long bucket paths). Hmm, fair point. I agree it's fairly pointless to have the full path written out, and presenting these as links would be more convenient. Will put in a ticket. 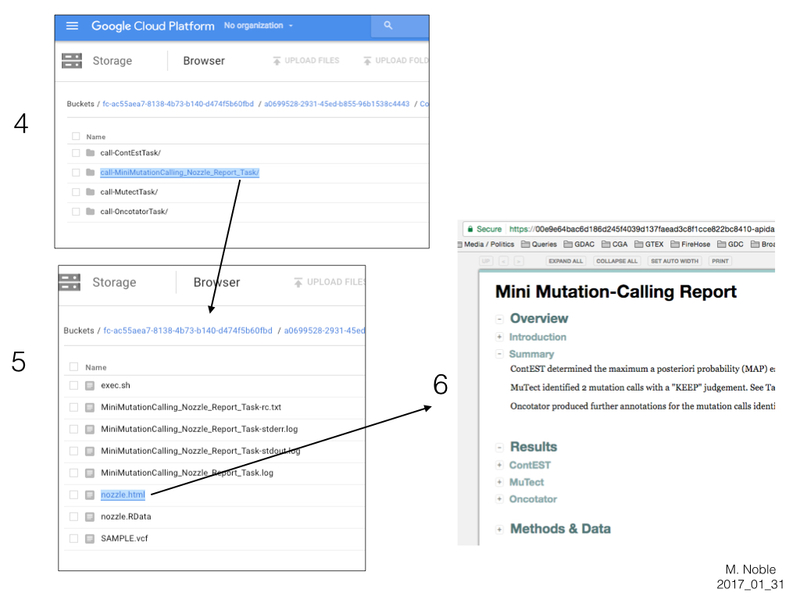 We can decide what to do if we change this - the one thing that is helpful with this is you get the full URL so you can copy and paste it into something (gsutil, TSVs for firecloud, etc). When you click the link, it's a different URL so you can't just copy paste that. I am not against changing this to much smaller text, just pointing out what will change. In the outputs list, the output names are direct links to the bucket locations so I can one-click to access them. 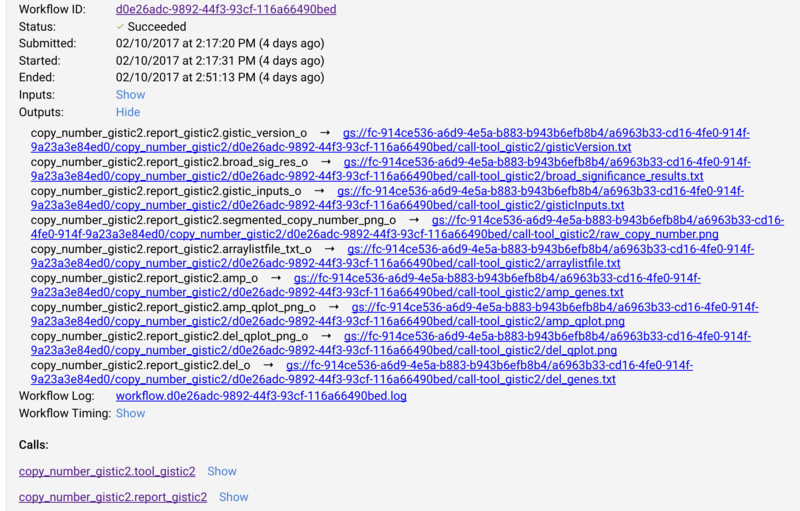 In addition, I am provided with a tsv file that recaps all the outputs and the corresponding gs:// paths. @mnoble and @esalinas, would you care to comment on how you feel about this option? @Geraldine_VdAuwera I like being provided a direct link (the first bullet). I think the TSV (second bullet) is also a good idea. They both help in "smooth" user work I think. For certain file types (maybe ".bam"?) file previewing could perhaps be disabled by default and if a user clicks a check-box then it comes up? I think the bucket links in the UI have extra stuff (like "https://console.cloud.google.com") that is not the exact GS-URL. If the direct-link you mention in the first bullet has this sort of extra stuff then, there should be a link that is copy/paste-able so that it can be used in a command-line gsutil command. In the file-preview box, the copy-pasteable link used to get there is usable for that purpose, but once you are in the file preview box, there is no copy-pasteable URL it has "Google bucket:" and "Object:" which means the copy-paste job has to be a two-step. do you think it would be nice if the preview box also had a copy-pasteable link so that you can easily download what you've previewed? I think a download button would be simpler, if I'm already previewing the thing -- I would prefer a one-click download then a copy paste operation, not you? @Geraldine_VdAuwera a download button is a good idea I agree! Great, I put in a ticket with a wishlist for improvements to the workflow exploration UI based on this thread, my own observations and feedback from a few others as well.